There is a famous quote by Wyatt Earp, "Fast is fine, but accuracy is everything." What anglers discover with experience is just that. In fly fishing, accuracy is everything. Whether it's the right drift in the feeding lane, the sightline of a cruising predator, or the right level of the water column, the difference between success and failure is often measured in inches. All modern fly rods are powerful, but accuracy is the new frontier in fly design. Making an 80-foot cast in saltwater is prospecting. Making a forty-foot cast on the nose of a laid-up tarpon is fishing. Reflect on your greatest successes and failures as an angler and the answer is clear. Accuracy breeds success. The H3 brings us a fundamental shift from flex profiles to a new frontier in accuracy and purpose-driven design. Helios 3F and 3D each offer uncompromising purpose. 3D is accuracy with power at distance for pinpoint delivery of larger flies. The difference is taper and stiffness, but the design foundation of accuracy remains constant. To play the game at its highest level there can be no compromise and for every angler the H3 is the pinnacle of purpose, designed to master the moment and meet the demands of accuracy on a tarpon flat with a 3D. Choose the game, then choose the weapon. Helios 3D 3-Weight, 7'6" Fly Rods offer enhanced accuracy and feel at mid-range distances. The Helios 3F 763-4 is a remarkable small stream rod that can place a fly between two branches into that back corner you've not been able to reach before with a fine touch, and a responsiveness you can feel up to your elbow. Cover a stream like never before and discover the difference superior accuracy can make. No cast ever thrown is identical to any other cast ever thrown. The variables of caster, rod, and conditions are too great. Helios 3F was designed to significantly reduce the variables at the point of release focusing the energy of the cast to the intended target. No matter what happens behind you, the energy of the forward cast is crisply released through a tight window created by the most significant reduction in horizontal and vertical tip frequency ever conceived. It is a rifle in a world of muskets and it autocorrects the variables of the cast to the target with incomparable precision. Helios 3D 3-Weight, 8'4" Fly Rods offer enhanced accuracy and feel at mid-range distances. The Helios 3F 843-4 is a pure dry-fly rod that offers a refined length with the delicate feel and accuracy desired to make perfect dry fly presentations. This model has been around for decades and is a favorite among dry fly purists. Now in its latest incarnation it offers uncanny accuracy and the ability to drop a dry fly gently in a precise feeding lane where the difference is of a couple of inches is all the difference in success and failure. No cast ever thrown is identical to any other cast ever thrown. The variables of caster, rod, and conditions are too great. Helios 3F was designed to significantly reduce the variables at the point of release, focusing the energy of the cast to the intended target. No matter what happens behind you, the energy of the forward cast is crisply released through a tight window created by the most significant reduction in horizontal and vertical tip frequency ever conceived. It is a rifle in a world of muskets and it autocorrects the variables of the cast to the target with incomparable precision. Helios 3F 3-Weight, 10'6" Fly Rods offer enhanced accuracy and feel at mid-range distances. The Helios 3F 1063-4 is an exceptional nymphing rod with the length you need to control your line during longer drifts and the 3F feel and responsiveness to allow you to detect subtle takes. An extraordinarily good rod for tight line nymphing with multiple flies. No cast ever thrown is identical to any other cast ever thrown. The variables of caster, rod, and conditions are too great. Helios 3F was designed to significantly reduce the variables at the point of release focusing the energy of the cast to the intended target. No matter what happens behind you, the energy of the forward cast is crisply released through a tight window created by the most significant reduction in horizontal and vertical tip frequency ever conceived. It is a rifle in a world of muskets and it autocorrects the variables of the cast to the target with incomparable precision. Helios 3F 4-Weight, 8'6" Fly Rods offer enhanced accuracy and feel at mid-range distances. The Helios 3F 864-4 is a fly rod that will appeal to any trout angler who loves to fish the entire water column. Besides being a dry-fly angler's dream rod, it can handle small streamers and light nymph rigs with ease. The refined length is not overwhelming and offers precision control along with 3F's enhanced accuracy with feel. If you're looking for a spectacular all around trout rod, look no further. No cast ever thrown is identical to any other cast ever thrown. The variables of caster, rod, and conditions are too great. Helios 3F was designed to significantly reduce the variables at the point of release focusing the energy of the cast to the intended target. No matter what happens behind you, the energy of the forward cast is crisply released through a tight window created by the most significant reduction in horizontal and vertical tip frequency ever conceived. It is a rifle in a world of muskets and it autocorrects the variables of the cast to the target with incomparable precision. Helios 3F 5-Weight, 8'6" Fly Rods offer enhanced accuracy and feel at mid-range distances. One of the great rods in Orvis history was the Henry's Fork, an 865 that in its day was one of the most popular rods in the lineup, and considered the very best "first" fly rod because of its remarkable versatility. The Helios 3F 865-4 carries on that tradition. 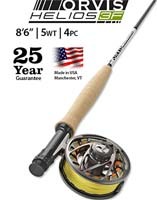 Besides being a dry-fly angler's dream rod, it can handle streamers and nymph rigs with ease and it's perfect for panfish and light bass fishing. 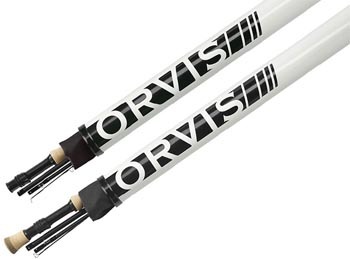 The refined length is not overwhelming and offers precision control along with 3F's enhanced accuracy with feel. If you're looking for a spectacular all around freshwater rod, look no further. No cast ever thrown is identical to any other cast ever thrown. The variables of caster, rod, and conditions are too great. Helios 3F was designed to significantly reduce the variables at the point of release, focusing the energy of the cast to the intended target. No matter what happens behind you, the energy of the forward cast is crisply released through a tight window created by the most significant reduction in horizontal and vertical tip frequency ever conceived. It is a rifle in a world of muskets and it autocorrects the variables of the cast to the target with incomparable precision. 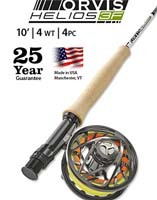 Helios 3F 4-Weight, 10' Fly Rods offer enhanced accuracy and feel at mid-range distances. When line control and mending are important, you want to fish a light line, and you need the accuracy to toss a streamer up and across to a far bank, the Helios 3F 104-4 is an exceptional choice with the length you need for mending and drift control, and the 3F feel and responsiveness to allow you to detect subtle takes. Whether you're swinging flies in the current or nymphing the run at your feet, this rod offers a big advantage over shorter fly rods. No cast ever thrown is identical to any other cast ever thrown. The variables of caster, rod, and conditions are too great. Helios 3F was designed to significantly reduce the variables at the point of release, focusing the energy of the cast to the intended target. No matter what happens behind you, the energy of the forward cast is crisply released through a tight window created by the most significant reduction in horizontal and vertical tip frequency ever conceived. It is a rifle in a world of muskets and it autocorrects the variables of the cast to the target with incomparable precision. The Helios 3F 5-Weight, 9-Foot Fly Rod offers enhanced accuracy but maintains the classic feel and finesse of the traditional actions. The Helios 3F 905-4 was designed to put an Adams in a teacup from 40 feet. The ultimate open water trout rod that offers pin-point accuracy in tight windows, a fine touch, and a responsiveness you can feel up to your elbow. No cast ever thrown is identical to any other cast ever thrown. The variables of caster, rod, and conditions are too great. Helios 3F was designed to significantly reduce the variables at the point of release focusing the energy of the cast to the intended target. No matter what happens behind you, the energy of the forward cast is crisply released through a tight window created by the most significant reduction in horizontal and vertical tip frequency ever conceived. It is a rifle in a world of muskets and it autocorrects the variables of the cast to the target with incomparable precision. 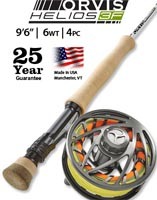 Helios 3F 5-Weight, 10' Fly Rods offer enhanced accuracy and feel at mid-range distances. The Helios 3F 105-4 offers the perfect compromise in strength and light outfit control and mending capability. The 5-weight is a versatile weight and can handle big fish, but still offers the pleasure of feeling the fight with smaller fish. The 3F 105-4 is an excellent all-around nymph and streamer rod with the length you need for mending and drift control, and the 3F feel and responsiveness to allow you to detect subtle takes, and make no mistake, if dry fly fishing suddenly appears, the accuracy of the 3F and the superior mending capability of a 10' rod will put the fly where it belongs and allow you to keep it in the zone longer. No cast ever thrown is identical to any other cast ever thrown. The variables of caster, rod, and conditions are too great. Helios 3F was designed to significantly reduce the variables at the point of release, focusing the energy of the cast to the intended target. No matter what happens behind you, the energy of the forward cast is crisply released through a tight window created by the most significant reduction in horizontal and vertical tip frequency ever conceived. It is a rifle in a world of muskets and it autocorrects the variables of the cast to the target with incomparable precision. The Helios 3F 6-Weight, 9-Foot Fly Rod offers enhanced accuracy but maintains the classic feel and finesse of the traditional actions. The Helios 3F 906-4 is an excellent choice for carp or small stream streamer fishing when roll casting comes into play. It's a great rod for quick precise casts to smallmouth bass and crappie. This is an excellent all around rod for the angler who likes variety and needs an accurate rod to deliver the fly in tight windows. No cast ever thrown is identical to any other cast ever thrown. The variables of caster, rod, and conditions are too great. Helios 3F was designed to significantly reduce the variables at the point of release focusing the energy of the cast to the intended target. No matter what happens behind you, the energy of the forward cast is crisply released through a tight window created by the most significant reduction in horizontal and vertical tip frequency ever conceived. It is a rifle in a world of muskets and it autocorrects the variables of the cast to the target with incomparable precision. Helios 3F 6-Weight, 9'6" Fly Rods offer enhanced accuracy and feel at mid-range distances. The Helios 3F 966-4 has a purpose in life and that is to handle heavier rigs and flies for big trout or bass. With the length you need for line control and the backbone you need to fight bigger fish, the Helios 3F 966-4 is the perfect rod to take to Alaska for big rainbows drifting egg patterns through a river full of spawning sockeye, or swinging big Tequeelys in Montana. Big bass bugs are not a problem and with the enhanced accuracy, that hole in the lily pads is a cinch. Put the fly where it belongs and stay in the zone longer. No cast ever thrown is identical to any other cast ever thrown. The variables of caster, rod, and conditions are too great. Helios 3F was designed to significantly reduce the variables at the point of release, focusing the energy of the cast to the intended target. No matter what happens behind you, the energy of the forward cast is crisply released through a tight window created by the most significant reduction in horizontal and vertical tip frequency ever conceived. It is a rifle in a world of muskets and it autocorrects the variables of the cast to the target with incomparable precision. Helios 3F 6-Weight, 10' Fly Rods offer enhanced accuracy and feel at mid-range distances. The Helios 3F 106-4. The 6 weight is a versatile rod that can handle everything from big trout, to bass, carp and even light steelhead. Make it 10 feet long and you have a rod that can reach out and control the drift, the swing, or can get the line out of the water and right on top of that nymphing run. Big flies, poppers, bulky deer hair patterns, heavy nymph rigs, no problem. No cast ever thrown is identical to any other cast ever thrown. The variables of caster, rod, and conditions are too great. Helios 3F was designed to significantly reduce the variables at the point of release, focusing the energy of the cast to the intended target. No matter what happens behind you, the energy of the forward cast is crisply released through a tight window created by the most significant reduction in horizontal and vertical tip frequency ever conceived. It is a rifle in a world of muskets and it autocorrects the variables of the cast to the target with incomparable precision. Helios 3F 7-Weight, 9' Fly Rods offer enhanced accuracy and feel at mid-range distances. The Helios 3F 907-4 can handle everything from big trout to larger bass. Big flies, poppers, bulky deer hair patterns, heavy nymph rigs, no problem. 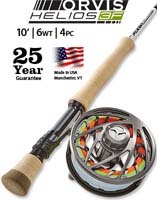 Excellent streamer rod for throwing weighted lines and big weighted streamers. No cast ever thrown is identical to any other cast ever thrown. The variables of caster, rod, and conditions are too great. Helios 3F was designed to significantly reduce the variables at the point of release, focusing the energy of the cast to the intended target. No matter what happens behind you, the energy of the forward cast is crisply released through a tight window created by the most significant reduction in horizontal and vertical tip frequency ever conceived. It is a rifle in a world of muskets and it autocorrects the variables of the cast to the target with incomparable precision. Helios 3F 7-Weight, 10' Fly Rods offer enhanced accuracy and feel at mid-range distances. The perfect rod for light steelheading as well as searching for big trout and bass with big flies, weighted lines, or heavy nymph rigs. The Helios 3F 107-4 has the length to reach out and control the drift and the power to handle the weight. Big flies, poppers, bulky deer hair patterns, heavy nymph rigs, no problem. No cast ever thrown is identical to any other cast ever thrown. The variables of caster, rod, and conditions are too great. Helios 3F was designed to significantly reduce the variables at the point of release, focusing the energy of the cast to the intended target. No matter what happens behind you, the energy of the forward cast is crisply released through a tight window created by the most significant reduction in horizontal and vertical tip frequency ever conceived. It is a rifle in a world of muskets and it autocorrects the variables of the cast to the target with incomparable precision. The Helios 3F 8-Weight, 9-Foot Fly Rod offers enhanced accuracy but maintains the classic feel and finesse of the traditional actions. The Helios 3F 908-4 is money when close accuracy is everything on the flats. The ultimate wading rod for tailing bonefish or reds when success is a 6-inch circle 40 feet away. No cast ever thrown is identical to any other cast ever thrown. The variables of caster, rod, and conditions are too great. Helios 3F was designed to significantly reduce the variables at the point of release focusing the energy of the cast to the intended target. No matter what happens behind you, the energy of the forward cast is crisply released through a tight window created by the most significant reduction in horizontal and vertical tip frequency ever conceived. It is a rifle in a world of muskets and it autocorrects the variables of the cast to the target with incomparable precision.